The court held the notification unconstitutional and said the decision was taken without consultations with employees or workers. On Saturday, Delhi High Court struck down a Delhi government notification, issued last year, that had hiked minimum wages for various categories of workers. The court held the notification unconstitutional and said the decision was taken without consultations with employees or workers. The notification of March 3, 2017, had hiked minimum daily wages to Rs 513, Rs 565 and Rs 622 for unskilled, semi-skilled and skilled workers respectively, up from Rs 374, Rs 414 and Rs 455 announced in 2016. 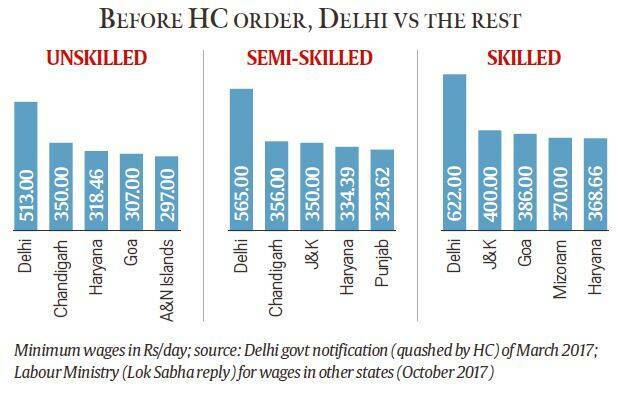 Either of these two sets of wages would have made Delhi’s minimum the highest in the country, as of October 1, 2017. A Labour Ministry reply to a question in Lok Sabha last year showed that as of that date, Chandigarh, Haryana and J&K were among the states/UTs that followed Delhi in wages paid to workers in these three categories. The categories are defined on the basis of specialisation, qualifications or experience, and vary from one field of work to the other. For example, a 2015 Labour Bureau report on wages paid to beedi workers in Madhya Pradesh had defined loading and unloading as unskilled occupations; wrapping labelling and bundle making as semi-skilled occupations; and driving among skilled occupations. Plant opened in Andhra. What is this new tech? 3 How is seniority decided in the SC?